You can permanently disable Mac OS notifications and any future notifications from apps you install on your Mac. Each time you install an app on your Mac, is chooses to send notifications from notification center and in most cases you never know the app did this. Instead of going into notifications each time to disable them per app, you can permanently disable the Mac notification center using Terminal commands and following the steps below. Note: There is an easier and less intrusive method to disable Mac Notifications, see further below in this article. First, ensure you have disabled System Integrity Protection on your Mac in order for the steps below to be successful. On your Mac, open Terminal in Applications -> Utilities -> Terminal. To completely disable the Mac OS Notification Center, type the following command in Terminal. Next, force quit the Notification Center to stop it by typing the following command in Terminal. At this point, the Mac Notification Center will be completely disabled and you will no longer see alerts, banners, or other notifications. If you decide to re-enable Mac Notification Center again, type the following command in Terminal. Go to System Preferences -> Notifications. Select Do Not Disturb and check From. Enter a From time hour with 1 minute ahead to another time, similar to the picture below. Use am/am or pm/pm. 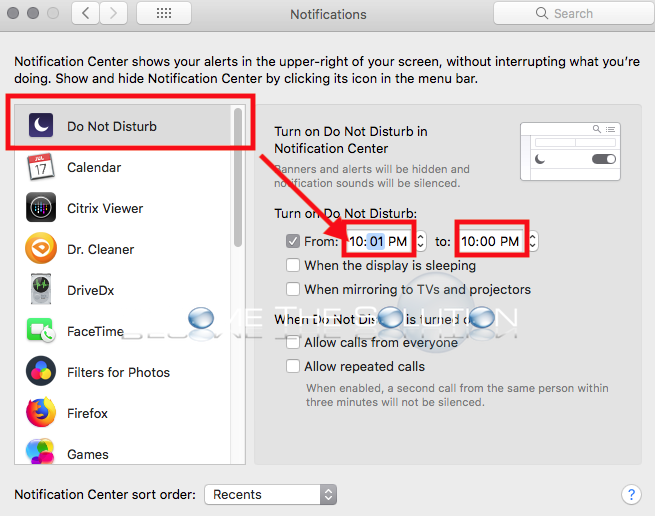 This will create a 24-hour Do Not Disturb schedule on your Mac, essentially disabling the Notification Center.